"Make no mistake. We will be watching what the IMF does," Pompeo said. "There's no rationale for IMF tax dollars, and associated with that American dollars that are part of the IMF funding, for those to go to bail out Chinese bondholders or China itself." ... forcing the central bank to institute soft capital controls and increasing the amount of red tape needed to access dollars. It has also presented the new government with its biggest challenge to date. Many analysts have recently said they expect that another IMF bailout, the second in five years, will be needed to plug an external financing gap. Also notably, much of this carnage accelerated since the start of January which coincided with Pakistan's decision to ditch the dollar (following Trump's remarks) and get closer to China. Furthermore, as we reported in December, Pakistan has been contemplating the move since last month's formal launch of the Long Term Plan for the China-Pakistan Economic Corridor (CPEC), signed by the two sides on November 21. The CPEC is a flagship project of China's Belt and Road initiative - the 3,000 km, over $50 billion corridor which stretches from Kashgar in western China to Gwadar port in Pakistan on the Arabian sea. We concluded our article by asking, even before the IMF news hit, "Will China step up?" Then, in early August, China did just that, when Beijing agreed to a reported $2 billion loan just days after the election of a new Pakistani premier and cricketing legend Imran Khan. China stepped up to reinforce a geopolitical alliance that shapes the South Asian nation’s policies toward the U.S. and India. 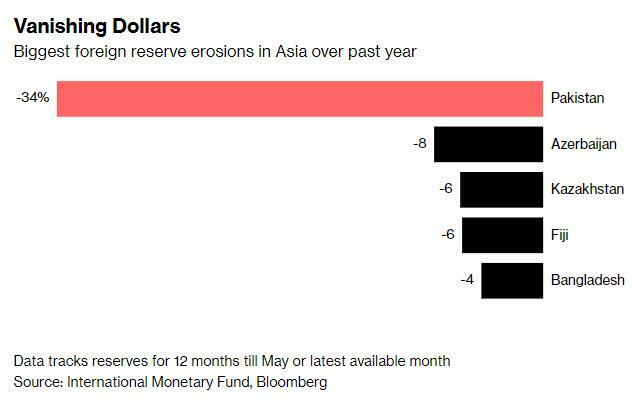 It turns out that was not enough, and despite US opposition, Pakistan's finance minister announced his country would seek a financial bailout from the International Monetary Fund as the country’s foreign reserves dwindle yet further. Asad Umar told the Pakistani news channel Geo TV on Monday night that Imran Khan, the prime minister, had decided to begin talks with the IMF to help the country weather its financial problems. “The prime minister . . . after consulting everyone decided today that we should open talks with the IMF,” he said. Cited by the Financial Times, the finmin added the talks would be aimed at agreeing “a program, a stabilization, a recovery programme, on which basis we could overcome this financial crisis”. While the country’s economy has double-digit growth, its trade deficit has proven to be a greater factor as imports are still outpacing its exports, making it difficult to maintain foreign debt repayments and draining its reserves as a result. Sources in the finance ministry told the Economic Times that government explored all options including asking friendly countries for support as well as seeking donations from the overseas Pakistanis before going to the IMF. The Financial Times first reported earlier this year that civil servants in Islamabad had drawn up plans for Pakistan to approach the IMF for a $12bn bailout — the largest in the country’s history. In the last few weeks, prime minister Khan had been pursuing other options in the hope of avoiding having to turn to Washington for support. Notably, his predecessor, Nawaz Sharif, turned to China for funding, securing loans of $5bn from Beijing’s state-backed banks last financial year and raising concerns about an increasing reliance on its northern neighbor. However, the country's reserve situation appeared to deteriorate rapidly last week, when the Saudi government rebuffed a request for Pakistan to delay payments for oil imports from the kingdom, according to officials, heaping further pressure on Islamabad’s stretched finances. 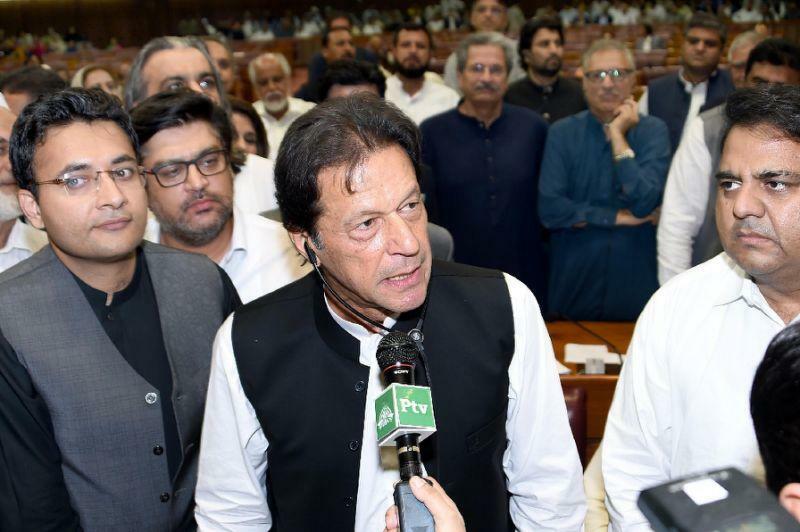 It was not known how much support the government would seek from the IMF but sources said that Khan's government needed at least $9 billion to meet the current account deficit. An assessment by the State Bank of Pakistan and the Finance Ministry showed that Pakistan needed $ 11.7 billion to service its external debt in current fiscal year 2018-19. The IMF assistance should be enough to bridge the deficit gap and support the plummeting foreign exchange reserves which have tumbled below $10 billion. To be sure, just like in the case of Argentina's president Mauricio Macri who recently requested a record $50+ billion bailout from the monetary fund, the decision to request an IMF bailout will create fresh hardship for Khan as IMF tough conditions will surely result in unpopular austerity and spending cuts. There is another similarity between Argentina and Pakistan: according to Bloomberg, Pakistan has availed 12 IMF bailouts since the late 1980s. The last one was in September, 2013 when the IMF approved a $6.6 billion loan support to Pakistan government's program to stabilize its economy and boost growth while expanding its social safety net to protect the poor. Who knows: perhaps one of these years, an IMF bailout may actually achieve its goal without destroying the country in the process.